Logo and web design, website development and social media management for a $1million charity drive for Cayman personality Derek Haines. 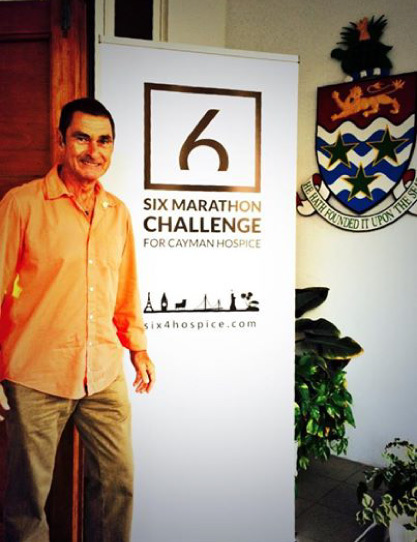 Derek is running 6 marathons in one year to raise money to build a valuable new facility fir Cayman HospiceCare. He came to Massive Media to help with all his online presence, logo development and some physical materials. With just over a week to complete the entire project we had to work effectively and communicate well with the client and related charities and sponsors to ensure everyone was represented properly and information was not confused in the rush. We presented two logo options and used the selection to drive the web design. Upon approval of design we worked simultaneously to develop the site and populate the blog and sections with content, setting up social media accounts to be ready to launch as soon as the website went live. Massive Media are proud to support Derek on his latest and most ambitious fundraising effort yet.